Why is my Canon 70D's liveview autofocus much worse than the viewfinder's? Why is my camera focusing fine in liveview but getting it wrong with the viewfinder? And they really surprise me because it's basically the opposite of what I experience. I've tried the Yongnuo EF 35mm and the Canon EF-S 10-18mm IS STM, and with both I experience the same: Using the optical viewfinder, I always have blazing fast, accurate AF. However using liveview, it is most of the time impossible to get a focus point at all, forcing me to move around and what not. The camera is a Canon 70D, supposed to have a good AF system. In a bright light condition both work perfectly fine so I doubt it's a defect, but in lower light situation I can never get a focus point with LiveView at all - No matter which AF method I select. This surprises me as the answers to the questions I've linked suggest that in low light, the LiveView AF should work even better. Does my camera and its dual-ISO make a difference? If anything I'd assume it'd make it better. Especially the video AF (which I assume does always use LiveView's CDAF?) for the 70D is praised to be outstanding, compared to its previous models. Again: Can't confirm. I haven't tried video in bright light (I'd assume that'd make it better though), but in low light (it's not that low by the way, it's a single, but bright and close-to-subject lightbulb spotlight) the AF in video is just as bad. Any explanations/insights/tips/tricks for a DSLR newbie like me? Additional info: When focusing manually, Magic Lantern's Focus Peak is able to draw in where the focus is too, and it works by detecting contrasts too. Unless I'm missing something doesn't that mean that Canon's CDAF should be able to find a focus point with CDAF too? Here is a screenshot of the scene: It's really not that little light! As you can see, ML has no issues drawing the focus peak into the right spot instantly. In addition to that: I'm sorry I didn't notice this earlier, but the camera actually does drive up the ISO while focusing when in LiveView. I couldn't get a screenshot of that but the subject was clearly visible (and in focus for a split second) during the AF attempt of the camera in LiveView. It just went past the focus point, and back again. Everytime I'd try to focus. The distance to subject is ~0.35m and my lens can focus up to 0.25m (even tho with the viewfinder I can focus as close as 0.15 sometimes). Just to make sure I've tried a longer (~0.5m) distance - Same results. I've also just tried to AF on my desk keyboard in absolute low-light (on the LCD, I see nothing but pitch black). 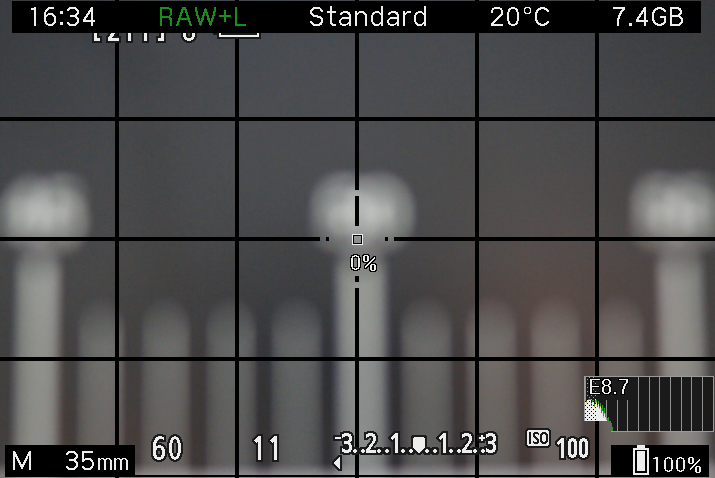 The camera was able to focus in LiveView properly and it turned up the ISO to the max. during the focus process. Conclusion: It's not the lowlight environment. What else could be the cause? Some more hints to "it's not low-light": The camera is perfectly capable of focusing on this in LiveView. I couldn't get the screenshot timed right, but this is during focus attempt. The camera was able to find focus on first try, even though the light situation is a lot worse. It's not the lowlight environment. What else could be the cause? In the case of your example photo, you're pointing at a spot on the lens cap that is black and pretty much featureless: no texture, no light/shadow, no contrast. In other words: nothing for the AF system to work with. Why doesn't auto-focus work with an all-white subject (like a wall)? But how come the viewfinder's AF is able to focus within a split second on the exact same spot? I mean, it's a Canon lens cap. There's the "Canon" logo on it which the viewfinder's PDAF is able to focus on instantly. What AF mode are you using with PDAF through the viewfinder? How many AF points are enabled? Are you using single point AF, expanded point AF, area AF, etc.? The 'Canon' logo is not in the center of the frame where it appears you have instructed the Live View AF to focus. I'm using single point AF with the center point enabled only, but I've tried all the modes through and I get consistent results with every mode. The only mode that differs is "Quick AF" for LiewView, that works just as fine, but since it disables and re-enables LiveView to get its focus I'm sure that puts more wear on the shutter so I'd rather not use it. The actual areas of sensitivity for each system can be different, even when you think you have the same focus "point"¹ selected with each independent AF system. When using the dedicated PDAF sensor via the viewfinder, the area of sensitivity, especially in the vertical direction, for the center AF 'point' is much larger than the little square you see in the viewfinder. It also seems to me, based on years of using the 7D and later similar Canon PDAF systems (5D Mark III and 7D Mark II), that even when a single point is selected with no 'assist' points enabled, if there is absolutely nothing the camera can find to focus on in the designated area for the selected AF 'point' then the camera will expand the search to find something, anything, that gives it enough contrast on which it can focus. When using Dual Pixel CMOS AF, the actual area of sensitivity doesn't seem to be quite as large, nor does the camera tend to expand the search until it finds something it can latch onto. Also please see updated question, the camera is actually able to focus on a similar (white font on black background) subject in near-pitch-black, so I really doubt low-light being the cause. In the last images you added, you have high contrast between the white lines and the black background. That's an entirely different situation than pointing at a featureless uniform surface. Low light will always reduce the capacity of an AF system to focus on the same thing. It may not reduce it enough to disable it, but AF always works better in brighter light than dimmer light. I'm thinking you're right about the contrast situation, but then again judging from other answers/comments the 70D should use PDAF in LiveView too, which is supposed to work (like it does in the viewfinder)? I mean I understand all the troubles of low-light/-contrast and such, but what I really don't get is how the viewfinder's AF is doing such an amazing job with the exact same scene then. 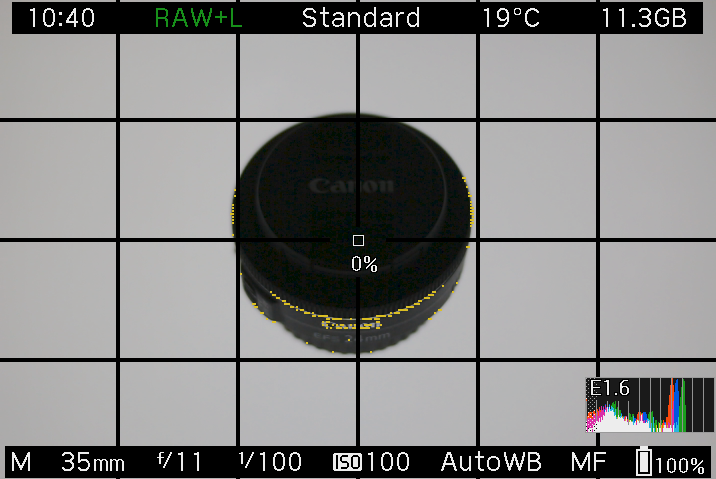 The 70D uses a hybrid of phase detection and CDAF when in Live View and using Dual Pixel CMOS AF. But it is not using the dedicated PDAF sensor that is used when you aren't using LV. The areas of sensitivity for each system can be different, even when you think you have the same focus "point" selected. The performance of each system will also be different because they are each using very different hardware from the other. The size of the photosites (pixels) in the dedicated PDAF sensor are 'huge' compared to the size of the 'half-pixels' on the imaging sensor used by the Dual Pixel CMOS AF. This makes them more sensitive in low light. Although I don't know it for a fact, my strong hunch² is that the sampling period for the dedicated PDAF sensor used when shooting via the viewfinder, particularly in 'One Shot', rather than 'AI Servo', mode, is significantly longer than the sampling period for sensor based Dual Pixel CMOS AF. ¹ No 'AF point' is actually a "point", it is an area for which the camera will (attempt to) find the greatest amount of contrast. This is true of dedicated PDAF sensors. It is also true of sensor based CDAF as well as sensor based hybrid systems. Both PDAF and CDAF are based on detecting contrast and using that information to focus the lens. How each type of AF system uses that information is different, but they're all based on detecting contrast. If they can't detect any contrast, they don't work. ² Based on several different things I've read Chuck Westfall, long time technical advisor for Canon USA, say over the years regarding PDAF and Dual Pixel CMOS AF combined with the requirement for the sensor to refresh fast enough to provide what amounts to a video feed for Live View. Please no longer upvote this answer. See comments as to why. LiveView uses Contrast AF which is considerably slower and older technology. However, through your lens, you're using Phase AF. Phase detection autofocus functions using a pair of micro lenses to compare light flowing through opposite sides of the lenses. It then aligns those two images on top of each other. Due to the images being drawn from a different position on the main lens the pair of images will be slightly different. However, the point of critical focus will be perfectly aligned. If this point of critical focus is within the bounds of the active autofocus point, the camera is in a focused state. Contrast detection autofocus, while comparably complex in theory, is actually much easier to understand in layman terms. 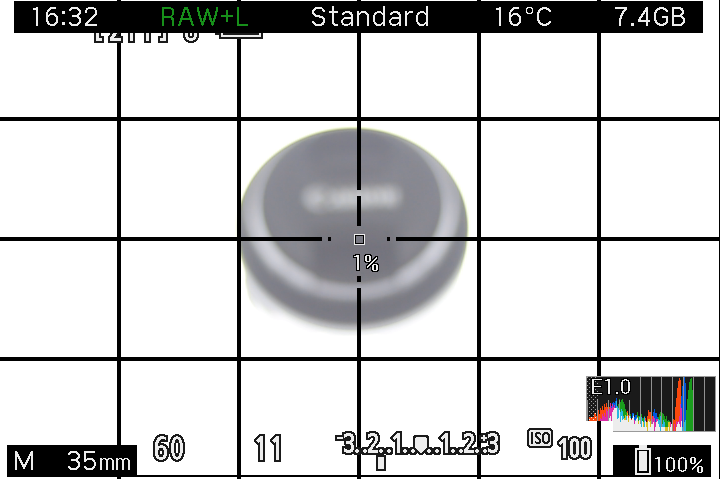 When autofocusing in live view, a DSLR records images from the sensor in real time that it then analyzes for the intensity of contrast between adjacent pixels within the bounds of the focus point. 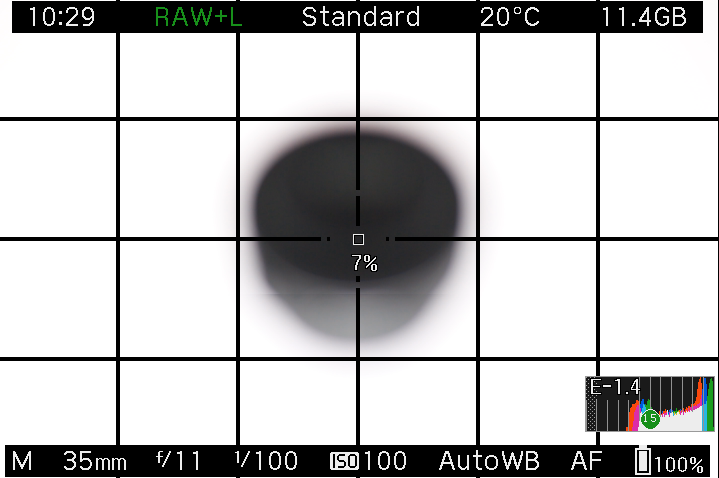 If the contrast intensity reaches a required threshold, the camera is in a focused state. Because contrast detection analyzes an image from the sensor itself, the analysis can be done on any area of the sensor without difficulty. 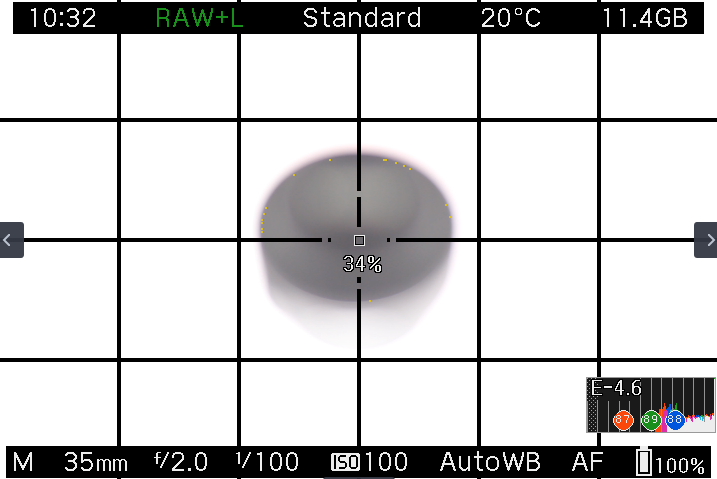 For this reason, live view autofocus can target even the far corners of the frame. It appears your experience with the camera is different from that of others because you have installed, and altered settings with, Magic Lantern. In particular, you appear to have configured your camera to use stop-down metering and focusing, even though the lenses you describe using are electronically controlled. This does not appear to be possible with the standard firmware. Magic Lantern likely allows it because it is useful for video work. However, it interferes with PDAF. Your experience should normalize if you reset all camera settings to default. Even if you have uninstalled Magic Lantern, altered settings do not revert to default unless explicitly changed using the standard firmware. PDAF requires adequate light to work. Go into a completely dark room, and AF will not work at all. If you have a light on a dimmer switch, gradually turn the light up and test AF against a distant object. As light levels increase, AF will go from not working at all, to working inconsistently, to working as expected. 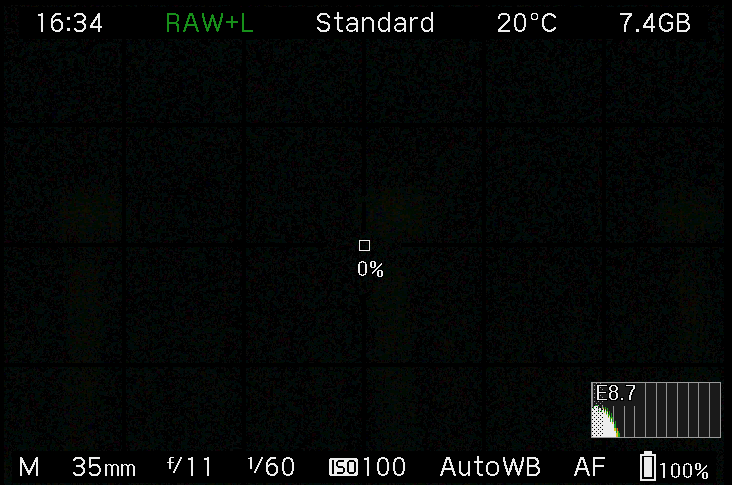 Setting ISO too low may affect the apparent amount of light the sensor is able to work with. PDAF requires a signal (contrast) to detect the phase of. Try focusing on a wall with lighting levels just low enough that the texture of the wall cannot be seen. AF will fail. PDAF works best when the aperture is wide open. As the aperture is closed, the phase differences are minimized. Everything becomes equally in-and-out of focus. Why is on sensor PDAF drastically slower than traditional PDAF? Why does the autofocus capability depend on the aperture rather than the amount of light available? Not the answer you're looking for? Browse other questions tagged canon dslr autofocus viewfinder live-view or ask your own question. Pictures of surfers start in focus then go out of focus? Why can't my camera autofocus in low light with a small aperture? Why isn't the gain on phase-detect autofocus sensors increased in low light? Why is it harder to focus using LiveView? How to reduce noise shown in LiveView when photographing in the dark? Is it normal for phase-detect autofocus to be inaccurate with a Canon EOS 750D and EF-S 18-55mm lens?